There isn't really a specific recipe for this one because you can be as creative as you like! We all made our paninis differently. Some used Just Mayo Chipotle as their condiment, while I made a garlic olive muffaletta-style tapenade to put on mine. 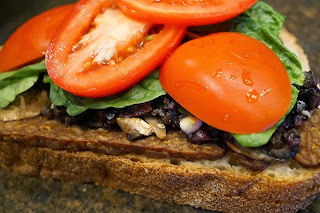 We each added smoked tempeh (Tofurkey brand) that I baked in the oven on 350 degrees (on non-stick foil -- NO OIL!) until dry and slightly crispy around the edges . Other toppings we used were spinach, roasted mushrooms, roasted red bell peppers, and tomatoes. This is a terrific lunch and a fun activity. 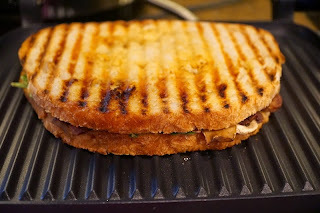 I have even heard of people using a skillet rather than a panini maker (we have a Hamilton Beach brand that was inexpensive and works well!) by placing their panini sandwich in the skillet, placing another skillet (bottom of it on top of the panini sandwich), then placing something heavy in the skillet to put pressure on the panini. Of course, you wouldn't have the lovely lines, but it would cook regardless.